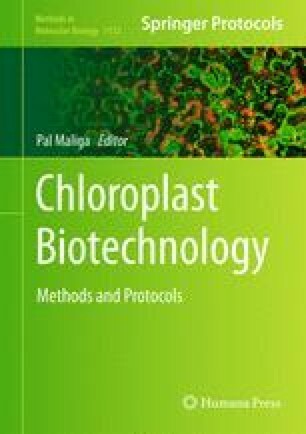 Sequencing of chloroplast genomes is a key tool for analysis of chloroplasts and the impact of manipulation of chloroplast genomes by biotechnology. Advances in genome sequencing allow the complete sequencing of the chloroplast genome and assessment of variation in the chloroplast genome sequences within a plant. Isolation of chloroplast DNA has been a traditional starting point in these analyses, but the capacity of current sequencing technologies allows effective analysis of the chloroplast genome sequence by shotgun sequencing of a preparation of total DNA from the plant. Chloroplast insertions in the nuclear genome can be distinguished by their much lower copy number. Short-read sequences are best assembled by alignment with a reference chloroplast genome. The authors thank the Australian Plant DNA Bank and Southern Cross Plant Genomics for assistance with samples and sequencing.